Even though the last thing on your kids mind is school during these fun summer months, we don’t want them to forget what they’ve learned either. As an homage to all their favorite school supplies, E is for Effort brings you the “Loose Leaf” burnout t-shirt. This limited edition tee is available through Artware Editions in NYC. Artware collaborates with visual artists that specialize in creating functional designs. 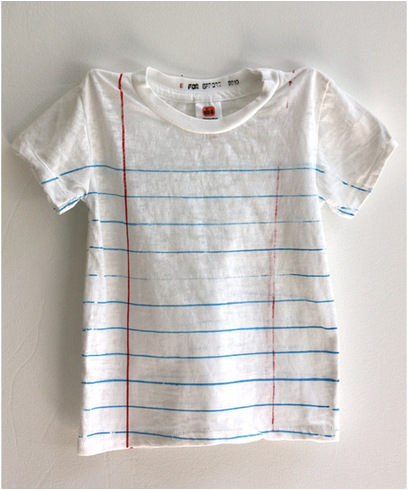 Purchasing this tee is a great way to show your support for the arts and remind your kids that school supplies are not only functional, but fashionable too. School’s been blown to pieces! Here’s a clip from Alice Cooper’s guest appearance on The Muppet Show back in 1978. His hit song “School’s Out” was the official heavy metal anthem for school kids everywhere. that’s really cute! I like!